The Estonian Native Horse, earlier also called klepper, is one of the last survivors of the horse breeds belonging to the Northern forest horse group that used to live in the forest areas of Northern Russia and were the horses of the local Finno-Ugris nations. Others (viatka, petchora, mezeni, obvinka, obi, tavda etc.) have disappeared and the nations that created and were using them are also disappearing. Or they have been developed into more or less cultural breeds (the Finnish horse). There are different opinions about the origin of the Estonian native horse breed. Its establishment is as hypothetical as the one of Estonians. Anyway, Estonians and their horses have lived on this territory more than 5000 years. The first written sources by the well-known traveller Adam von Bremen from the 11th century and the chronicles by Latvian Hendrik from the 13th century confirm, that Estonians were rich in gold and they had good horses. The breed has been appreciated by many nations and many stallions and mares were deported to Sweden as military horses and to Russian provinces to improve their local horse breeds. Discussions have been held on the effect of knight horses (among these Arab Breed) on the Estonian Local Horse breed during the Middle Ages. It is obvious, however, that peasants succeeded to keep their horses apart from foreign “manor culture”. On the 19th century a measures for development of the breed were put into practice: shows of the breeding horses, drawing and carriage competitions, awarding of the better horses and auctions. In the end of the century several studs were founded: 1856 in Tori on the mainland, 1870 in Uue-Lõve and 1902 in Uue-Mõisa on the island Saaremaa. After the devastating influence of the World War I, the planned and purposeful pure-breeding of the Estonian Native Horse was started in 1921, when the Estonian Native Horse Breeders Society was founded. During 1921-1937 totally 13 stallions have been used in the breeding of the Estonian Native Horse. This has increased the wither height, white markings and chestnut colour of the breed that were mostly bay and without markings. In the middle on the 19th century a strong horse was required in agriculture. For this purpose from Estonian Native Horse breed a universal Tori breed and Estonian heavy draught breed were developed by the 1920ies. 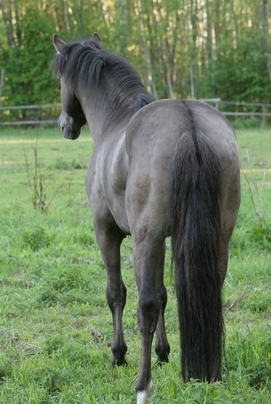 The purebred Estonian Native Horse stayed on the islands and cost of the Western-Estonia thin soils. Such regional placement lasted until the beginning of 1980ies when the breed become a riding horse for children and tourism. In 1992 re-founded Estonian Horse Breeders Society subsidizes the Estonian Native Horse foals with the help of government, society also organizes annual inspections and experimentations. In 2000 founded Estonian Native Horse Conservation Society, which unites the friends of the breed, organises group-events, exhibitions and bees, publishes books and newsletters. Estonian Native Horses' head is proportionally small, wide and deep. The neck is wide and thick. The chest is wide, buttock round, limbs strong and clean, and feet hard. Temperament is lively, character good. As a fault, there is sometimes incorrect standing and sway back. Analys showed that the Estonian Native Horse is one of the few breeds, which has retained the characteristic features of the native horse and were not significantly influenced by crossing with other breeds. The average measurement (in cm) are: stallions - height at withers 144.2, oblique body length 145.4, chest girth 169.8, cannon bone girth 18.9; mares 142.1-145.4–178.0–18.4 respectively. The measures of two-year-old young mares were 137.2-137.8-164.1-17.8 cm; and those of three-year-olds 139.3-141.8-172.0-18.4 cm and those of four-year-olds 141.0-143.9-172.5-18.3 cm. The predominant colors are bay, chestnut, black and gray; there also occur dun, cream and mouse-dun. The changes in coat colors show, that the color of a horse has become more important to the owner. A hundred years ago, most important was considered horses’ ability to work, but today a colorful horse is considered most “beautiful”. The number of gray horses is increasing and chestnut color is decreasing (from 34.0% to 17.9%). The number of Estonian Native Horses decreased years ago and the breed has been entered in the Watch list of endangered domestic animals. Presently, the total number of Estonian Native Horses is around 1000, less than half of mares are used for breeding. The genetic diversity is attempted to maintain in breeding, preserving the existent 6 lines. Industrial, one-time crossing with Shetland pony or Arab Horse produced numerous ponies. Fortunately, we carried out strict selection among thoroughbreds and thus we succeeded to keep our breeding horses. To keep our unique Estonian Native Horse breed, must the horse breeders decide, what is the purpose of this breed and stick to this breeding plan. Due to its inexpensive price and low maintenance, Estonian Native breed is a suitable simple domestic horse, a companion at a suitable simple farm. Estonian native horses are kept as tourism horses in several tourism farms. On their backs or in their pull-carts, archaic villages, ruins of strongholds and natural sights are visited. The preservation of the Estonian Horse is conducted in co-operation with environment protection programms, for example, maintenance of heritage ensembles (especially meadows and coastal pastures). Owners are paid subsidies by environment funds for pasturing the horses on these areas. A preservation area for the Estonian Native Horse has been created (officially Laidevahe bird preservation area). Estonian native horse has found a developing field of activities in sports as a horseback riding pony. 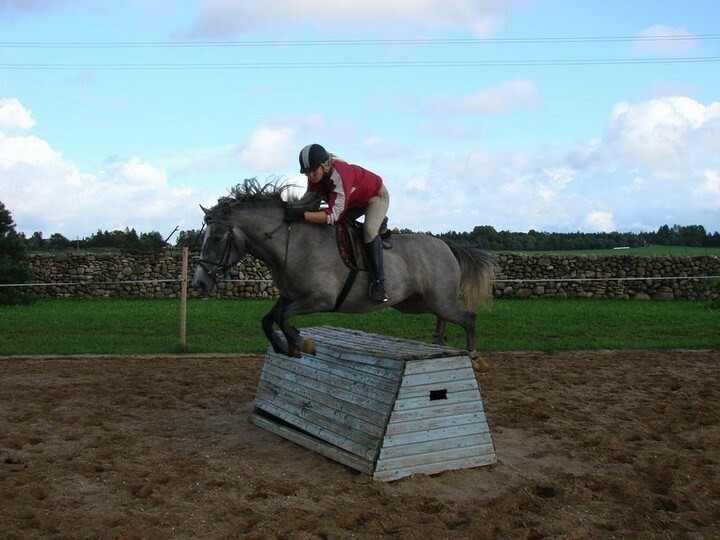 They participate in races and show jumping.